If you have ever ventured to the hustle and bustle that is the Venice Beach Boardwalk then you have also whiffed the overwhelming scent of weed, walked through a cloud of smoke, or strolled into a marijuana shop. In fact, to know Venice Beach is to know (or at least smell) marijuana. It’s the town’s very own version of a welcoming committee and an ever-occurring component of the beach town’s culture. After all, that’s why we posted up two MedMen weed shops in the area: Abbot Kinney and Lincoln Boulevard envelop the area perfectly—a town with it a distinct tie to cannabis culture. Understanding Venice’s relationship with cannabis really lies in the individuals—and their various lifestyles—who called and continue to call Venice home. 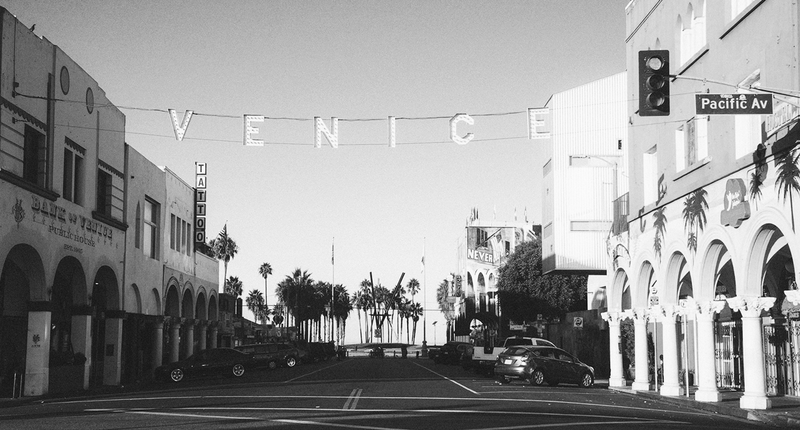 Founded by the powerful developer Abbot Kinney, Venice was crafted to uphold a culture of sophistication—although that’s not how it totally played out. Impacted by the Great Depression, the city became a place for drifters and those looking to escape squalor, which is how Venice achieved the status of “slum by the sea.” The individuals who occupied the various tent cities operated as a complete dichotomy to the town Kinney was crafting: one where upscale resorts and cultural attractions were meant to woo and draw in visitors and residents. But these two disparate camps led to the colorful personality of Venice that we all know and love today. As time went on and cultural movements shifted, Venice continued to operate as an oasis for free-floating types. The Beat Generation made Venice home during the 50s and 60s. Poets, artists, musicians, authors—the creative class thrived in and around these parts. And then, of course, came the icons within music, surf, and skate. The Venice coffee houses around the area that were sustained by beat culture and later hippies gave birth to numerous musical legends. The Doors came from Venice. Jane’s Addiction and punk rock bands such as Suicidal Tendencies did too. Then came the infamous skate and surf culture in the area. Venice—and nearby city of Santa Monica—got its nickname Dogtown from the ragtag assemblage of Z-Boys—the group of locals that operated at the epicenter of the skate and surf world. Needless to say, a lot was happening in this town. It’s no secret that many of these movements were intrinsically tied to drug use—marijuana was one of the substances included in that bunch, particularly when it came to hippie culture. Hippie-laden in the 60s ushered in a steady presence of the flower. Venice is a beacon of a city that not only tolerates non-conformity—it welcomes it with open arms. It’s this exact approach to living that enabled various pot shops to open up around the town after California voters legalized weed in 1996. More than a decade later, cannabis is fully legalized for both recreational and medicinal use and Venice is a leader in the marijuana business space. That’s why you see two MedMen Venice dispensary stores —how could we resist the town that had such a vital impact on the marijuana movement. Ready to explore and enjoy all Venice has to offer? Check out the cannabis connection by visiting either one of our stores in the lively town. Trust us: you won’t regret it.